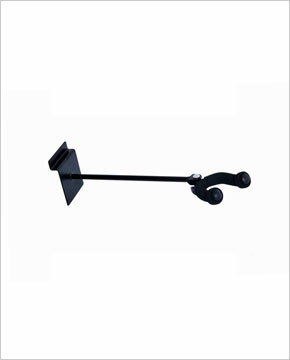 Ideal for the professional, these hangers work well for advancing guitar players and can be used by aspiring players too. 9 inch long arm with swiveling yoke. All swivel in the horizontal plane. Swivel can be locked with included wing nut. Cushioned yoke arms with security strap. KB922G has a 9" offset for acoustic guitars. Electric guitars can also be used on the KB922G acoustic hangers if needed.